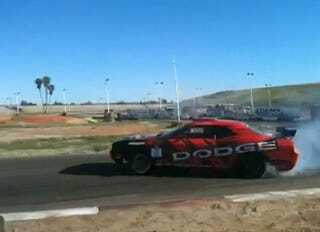 Crazy Swedish drifter Samuel Hubinette's as-yet unreleased Dodge Challenger SRT8 2010 Formula Drift car was spotted by reader n1ftyneil testing at Adams Motorsports Park yesterday. The sound of the 410 c.i. methanol motor revving to 8500 RPM is glorious.